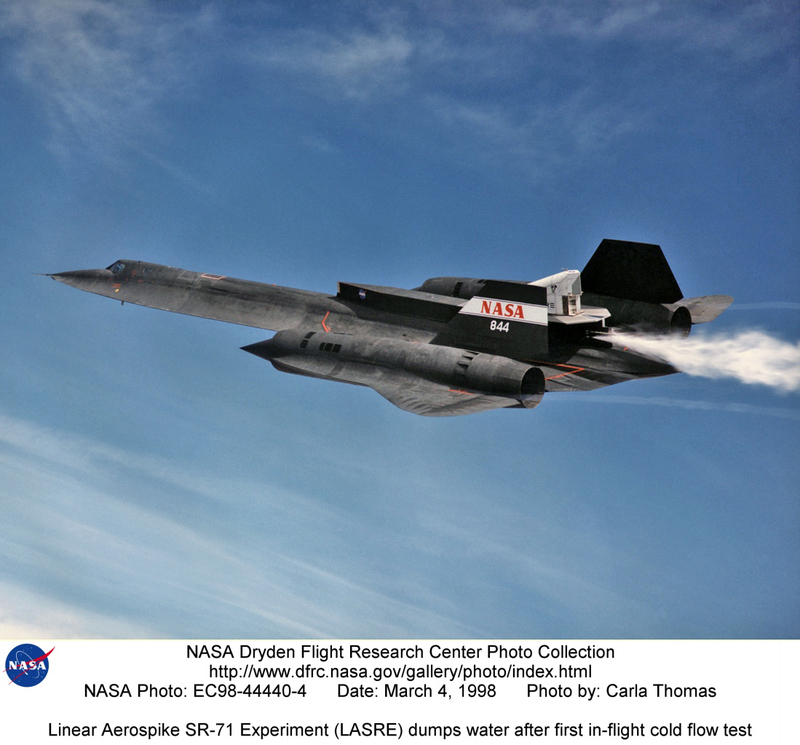 Description: The NASA SR-71A successfully completed its first cold flow flight as part of the NASA/Rocketdyne/Lockheed Martin Linear Aerospike SR-71 Experiment (LASRE) at NASA's Dryden Flight Research Center, Edwards, California on March 4, 1998. During a cold flow flight, gaseous helium and liquid nitrogen are cycled through the linear aerospike engine to check the engine's plumbing system for leaks and to check the engine operating characterisitics. Cold-flow tests must be accomplished successfully before firing the rocket engine experiment in flight. The SR-71 took off at 10:16 a.m. PST. The aircraft flew for one hour and fifty-seven minutes, reaching a maximum speed of Mach 1.58 before landing at Edwards at 12:13 p.m. PST. "I think all in all we had a good mission today," Dryden LASRE Project Manager Dave Lux said. Flight crew member Bob Meyer agreed, saying the crew "thought it was a really good flight." Dryden Research Pilot Ed Schneider piloted the SR-71 during the mission. Lockheed Martin LASRE Project Manager Carl Meade added, "We are extremely pleased with today's results. This will help pave the way for the first in-flight engine data-collection flight of the LASRE." 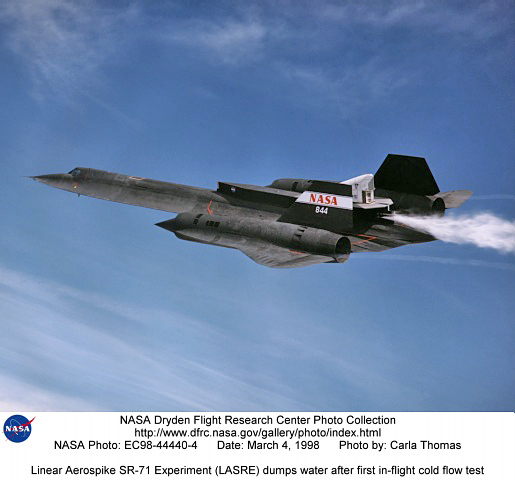 Keywords: LASRE; Linear Aerospike SR-71 Experiment; SR-71A; Blackbird; Dave Lux; first cold flow flight; water dump; Ed Schneider; Lockheed Martin; Rocketdyne; Dryden Flight Research Center; X-33; linear aerospike rocket engine; Linear Aerospike SR-71 Experiment.